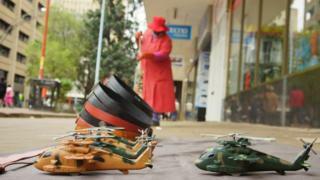 Dis na some of di best photos from across Africa dis week. 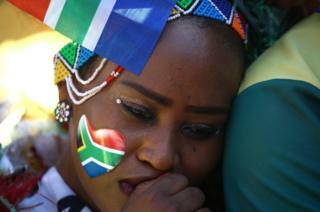 Na so-so disappointment full Pretoria, South Africa, on Wednesday after dem miss out to France for chance to host di Rugby World Cup in 2023. Plenty people don expect South Africa to win di vote after one independent review say dem dey ready to host di tournament. 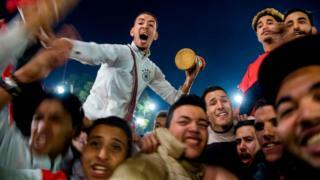 For di other end of di continent, for Marrakech, Morocco, na smile and jollificate plenty, after dem beat Ivory Coast on Saturday, to collect dis place for di Football World Cup inside Russia next year. Elections na im full di continent again dis week. 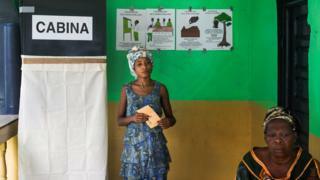 Dis woman dey vote her own inside Equatorial Guinea dia legislative elections on Sunday. 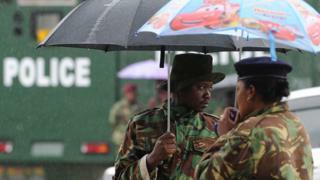 For Kenya, two soldiers dey hide from di rain, under some play-play umbrellas as dem dey guard di Supreme Court for Nairobi. Judges here dey put eye inside case to cancel di results of di 26 October vote - wey be di second presidential election, after di first one dem do for 8 August. For south side, one trader dey sell im market for Harare, Zimbabwe, just one day after di country dia military seize power. Army chiefs say dem dey comot criminals wey dey inside di ruling party Zany-PF, but dem go still hand power back to civilians. 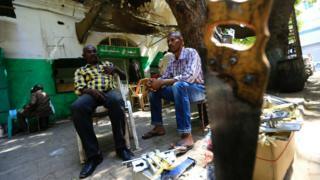 Some days before dat one, on Saturday inside Khartoum, Sudan, traders dey hope to see customer attract to dia business. E be like dis men dey sell tools. 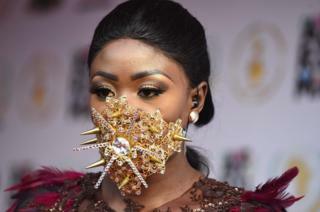 Ghanaian model Nana Akua Addo add some extra shakara during her waka on top di red carpet for di All Africa Music Awards for Lagos, Nigeria, last Sunday. For Egypt, dis photographer dey give us fresh way to see di mummies inside one Cairo museum on Wednesday. 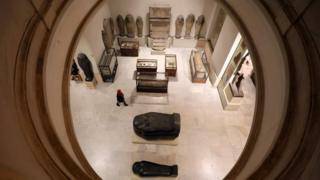 Di Museum of Egyptian Antiquities bin open earlier dis year. History, art and sport na im join-bodi inside dis picture, wey dem take for Abidjan, Ivory Coast, on Tuesday. 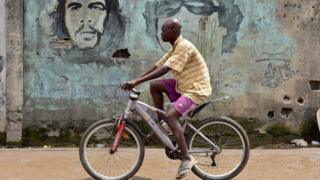 Di man dey cycle past graffiti painting of Che Guevara (left) and former Libyan leader Muammar Gaddafi. 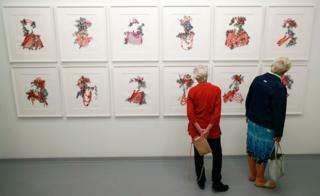 For Cape Town, South Africa, everything dey about art since dem open di new Zeitz Museum of Contemporary Art Africa (Zeitz MOCAA) for di V&A Waterfront. Dis women dey put eye well-well for work by Nigerian artist Taiye Idahor on Wednesday - and all citizens of Africa get chance to enter for free.